So here we are again, another year later. When I first started this blog, did you ever expect it to last four years? I surely didn’t. 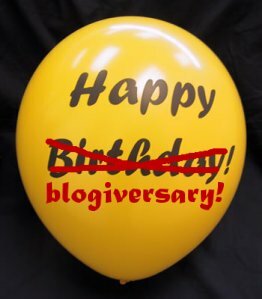 But today does, in fact, mark the four-year blogiversary of Martin’s Musings, and at least for me, that’s reason to celebrate. Looking back on another year of musings, a few things pop out. First, there was “Curiosity Killed My Appetite,” the post that was read more than any other — 2,400 hits in three days! There was also the election, which culminated in Barack Obama being chosen as our next president; I documented my support of Obama in many posts last fall. The week in April when I saw Flight of the Conchords, Lily Allen, and Bruce Springsteen (twice!) in concert. And the times when I’ve pigged out and then attempted to watch my weight. But that’s just a sampling of the many, many things I’ve written about. In short, the past 12 months — or at least the past eight, ever since I got a new job — have truly been a lot of fun, and you, my readers, have been right there with me along the way as I’ve ranted, raved, documented, and posted. In fact, I can tell you that more than 12,125 visitors in the past year clicked on more than 15,330 pages of this blog — and that doesn’t include all the folks who’ve read these posts on Facebook. In four years, I’ve written close to 1,280 blog posts. Anyone want to guess how long it’ll take me to double that number?